International Women’s Day is when we celebrate being women and acknowledge the challenges we face and often overcome. These Aboriginal artists lived a traditional nomadic lifestyle before the “white fella” found them in the desert. Given the lack of valuable resources and remoteness of the Warlpiri land the skin groups were mostly left to continue their life unhindered. However, some were pressed into domestic servitude as well as experiencing violence at the hands of the white settlers. The Coniston massacre was amongst some of the worst violence visited upon them seeing many retreating to place like Mt Theo to hide. The spirit the Warlpiri people retained despite the harshness of the new life thrust upon them has passed onto future generations. Judy ( in the forefront) was instrumental in retaining knowledge of Country by sharing her life stories and Mina Mina Dreaming with the younger children. She was the embodiment of strength and wisdom who became an internationally renowned artist despite all the challenges she and other Warlpiri woman faced. We have recently built a Testimonial page under our About section on the website. If you have bought from us and would like to give us some feedback please email us at alexandra@baygalleryhome.com and we will add your comments to our site. We send products all over the world ensuring they are all the best quality and safely packaged and as such we've never had anything returned, which we're very proud of. If you intend to buy from us but are mulling over which wonderful Bay Gallery Home item to buy please keep our Testimonial page in mind should you go ahead with purchasing from us. Sabrina is a young Aboriginal Central Desert artist related to the famous colour field abstractionist Shorty Jangala Robertson; like Shorty she paints Ngapa Jukurrpa (Pirlinyarnu) inheriting it from her father and grandfather who in turn learnt it from generations across millennia. Her mother is the world renowned artist Dorothy Napangardi (recently featured in the Australia exhibition at the Royal Academy). Mount Farewell (Pirlinyarnu) is where Sabrina's Dreaming sits in her traditional lands are. 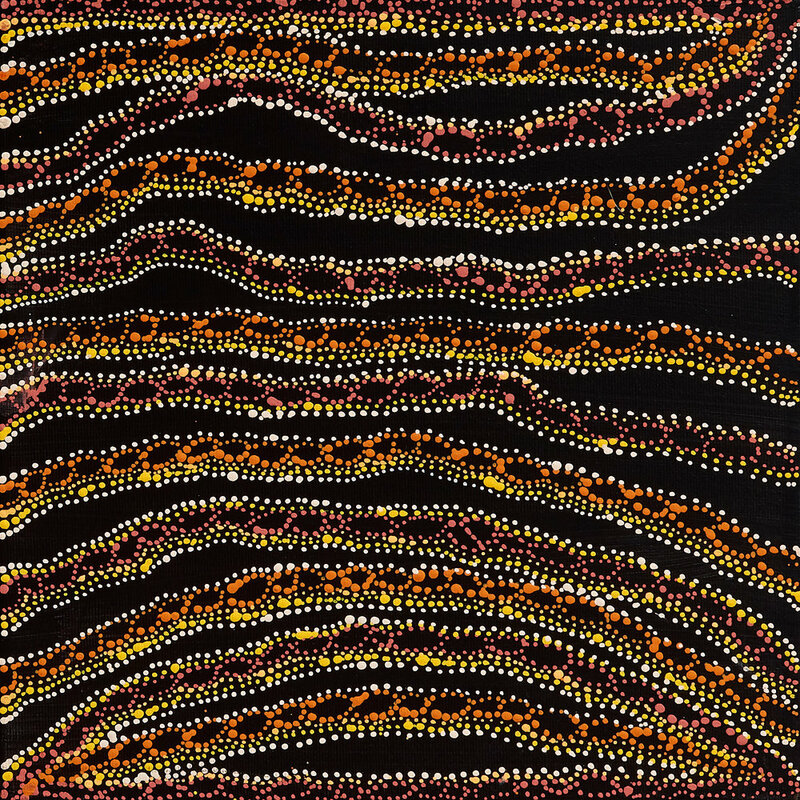 She has chosen to depict the sacred Dreamtime story, in a way unique to her, where water appears to travel across the canvas with small water soakages encased in the rain drops and native plants and animals dot the land. 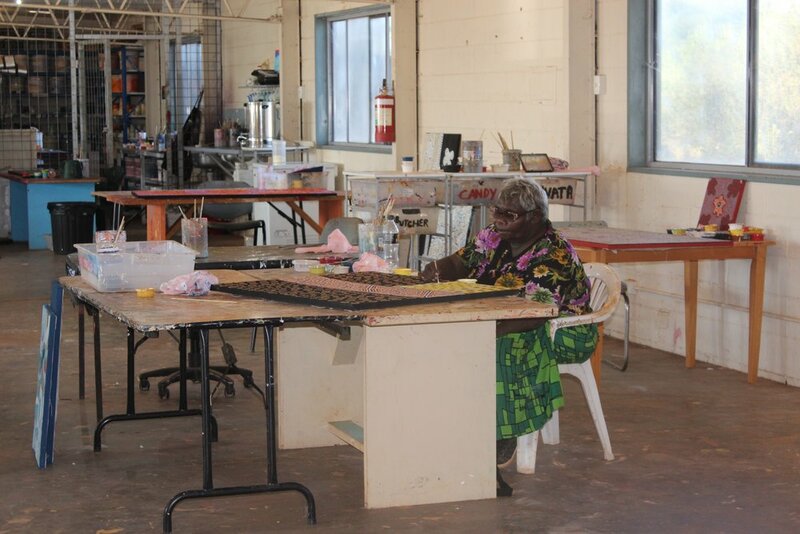 In 2014 her work was selected for 'Same Country Same Jukurrpa' at the Australian Museum. Sabrina's painting was shown alongside hugely important artists of the desert community she comes from including Judy Napangardi Watson, Alma Nungarrayi Granites and Otto Jungarrayi Sims. The exhibition followed on from the world's first Aboriginal women only exhibition held at the Museum in 1992 entitled 'Woman Artists'. The new exhibitions aim was to show the development in artistic styles amongst the artists as they moved away from traditional circular dot painting to establish their unique styles as artists whilst sharing their ancestors stories. Over December we have many beautiful gift ideas for you (we should all treat ourselves to a guilty pleasure at Christmas time) and your loved ones including our stock of fabulous paintings and our new home and giftware items. Keep an eye on our website for new products as it will be updated over the next week. On December 7 we will be open late for the Tetbury, Gloucestershire Christmas light party. As the main event is on our doorstop we're the perfect place to party while you shop. We'll be keeping things merry by serving wine, beer and cheeses. On December 18 we will be holding another event as part of the Tetbury Edit collective - we'll be sharing more on that later. Our last day of trading in the gallery is Saturday 23 December until 2 January. We can honour any websales over that period but please take into account post office opening times. Papunya Tula is the legendary site where the contemporary Aboriginal art movement bloomed becoming famous for its Western Desert dot art. Amongst the different displaced Western Desert people's brought to Papunya Tula (Tula meaning small hill where a Honey ant dreaming sits) were Tommy Watson, Clifford Possum and Ningura Napurrula, each of whom went on to become wildly successful international artists. The original company now operates from Alice Springs but we paid a visit to the existing art centre and found some of the sacred iconography depicted in the early works honoured while developing new interpretations of their ancient Dreamtime stories. We had to keep a respectful distance while photographing the artists. Close up the paintings were breathtaking. Below is the landscape around the art centre.